Apr19 by John M. Buol Jr.
EIC matches are not something most Soldiers have heard of, let alone competed in. In fact, “a lot of Soldiers, especially Army Reserve Soldiers, don’t know the world of competitive shooting even exists,” said U.S. Army Reserve Sgt. 1st Class Bradford Griffith, who is a noncommissioned officer on the 108th Training Command (IET) drill sergeant recruiting team out of Charlotte, North Carolina. His personal passion for marksmanship is in step with U.S. Army Reserve top leadership, and something he said he takes personal responsibility in. “LTG [Charles D.] Luckey, the chief of the Army Reserve, has been very clear on his guidance and that is to make the force more lethal, and that’s kind of been my personal charge,” said the Soldier who once served as an Army Reserve drill sergeant. So with the goal of teaching others through experience, Griffith put together a team of former drill sergeants and a drill sergeant candidate to compete and get the full All Army experience. U.S. Army Reserve Sgt. 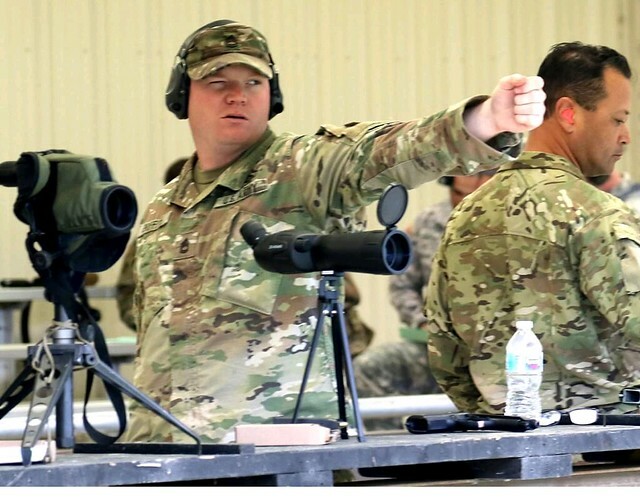 1st Class Bradford Griffith, who is assigned to the 108th Training Command (Initial Entry Training) out of Charlotte, North Carolina, checks his teammates hits at the bullseye match during the 2018 U.S. Army Small Arms Championships at Fort Benning, Georgia March 11-18, 2018. Apr18 by John M. Buol Jr. Effective machine gun use requires understanding machine gun gunnery theory. This understanding is what makes a machine gun an effective crew-served weapon capable of suppressing and controlling large target areas. Failing to understand and apply these concepts reduces a machine gun to a large and clumsy belt-fed rifle limited to engaging single point targets. A gunner’s knowledge of the machine gun is not complete until they learn about the action and effect of the projectiles. The Line of Sight is an imaginary line drawn from the firer’s eyes through the sights to the point of aim. The Burst of Fire is a number of successive rounds fired from the same hold and aim point, such as the same Traverse and Elevation mechanism setting, when the trigger is held to the rear. The number of rounds in a burst varies depending on the type of fire employed. The trajectory is the curved path of the projectile in flight from the muzzle to impact. As the range to the target increases, so does the curve of trajectory. Maximum ordinate is the highest point above the LOS the trajectory reaches between the muzzle of the weapon and base of target. It always occurs about two-thirds of the distance from weapon to target and increases with range. The cone of fire is the pattern formed by the different trajectories of individual rounds in a burst as they travel downrange. Fired at a two-dimensional paper target the cone of fire should appear like a group and be roughly circular in shape. Various factors effects this but the gunner’s Stability and Control have the biggest influence. ground or target area. The size and shape of the beaten zone changes based on the distance and slope of the target area but is normally oval or cigar shaped with the long axis along the gun-target line. At closer range the beaten zone is longer and narrower and becomes shorter and wider as distance increases. On rising ground, the beaten zone becomes shorter and ground that slopes away causes the beaten zone to become longer. Gunners and automatic riflemen can take maximum effect of this by aiming at the center base of a target area as most rounds will either be direct hits or fall a bit short, increasing chances of on-target ricochets, better enabling spotting the strike of the rounds to adjust fire from, and increasing suppressive effect on the target area. The effective zone encompasses about 85% of the fired shots. The danger space is along the gun-target line from muzzle to target where the trajectory does not rise above 1.8 meters above the ground, or the average height of a human adult. These characteristics help describe various classes of fire. With respect to the ground, the two classes are grazing and plunging fire. Grazing fire occurs when the center of the cone of fire does not rise more than one meter above the ground. Continuous grazing fire effectively creates a fence that is nearly impassable. The gunner does not have to aim at a particular target along the line when grazing fire is used because anything trying to pass that line when a burst is fired is almost certain to be hit. This is ideal for final protective fires along a final protective line in the defense and can be used offensively as well anywhere the terrain is level or sloping uniformly along a line from the gunner’s position. Dead space is any bit of ground that interrupts this continuous line, such as a small depression, and must be covered by a weapon from a different position or one capable of indirect fire, such as a grenade launcher. Over uniformly sloping terrain, 5.56 and 7.62mm machine guns can attain a maximum of 600 meters of grazing fire and heavy machine guns can push this to 700 meters. Grenade machine guns with a sharply arcing trajectory cannot use grazing fire. zone, thus the weapon’s effect is limited to placement of the beaten zone as grazing along the length of the gun-target line is not possible. Plunging fires happen when firing at long range beyond the grazing fire maximum effective range, when firing high to low ground or low to high ground, or firing across uneven terrain which breaks up the danger space needed to maintain grazing fire at points along the trajectory. All fires from grenade machine guns is always plunging fire. Fires with respect to the target include enfilade, frontal, flanking, and oblique fires. Leaders and gunners should always strive to position gun teams so that the long axis of fires, grazing and beaten zones falls along the long axis of the target and target areas. Enfilade fire occurs when the long axis of the beaten zone coincides or nearly coincides with the long axis of the target. Derived from the French meaning “to thread” enfilading fires takes maximum benefit of the effects of grazing and beaten zone. Frontal fire occurs when engaging a force facing toward the gun position. It is enfilading fire when the target area is advancing forward in a column formation. Flanking fire is delivered directly against the side of the target area and becomes enfilading fire when employed against a line formation. Oblique fire occurs when the long axis of fires is an angle other than a right angle to the front of the target. Proper positioning of gun teams requires determining likely avenues of approach and setting up so as to place the long axis of fire along the long axis of the target area. It’s worth noting that routine qualification fails to take this into account as the ideal place to put crews on a transition range would be to fire across the side of the range as that would enfilade fires across all the targets in all of the lanes. Obviously, this will won’t fit in the existing Surface Danger Zone and Range Control will be very angry with you, however, understanding this will help taking the machine gun marksmanship skills tested in qualification into real world application. searching, swinging traverse, and free gun fires. Fixed fire is possible when the point target or target area can be effectively engaged within the width and size of the centered beaten zone or grazing fires with little or no manipulation required. Most target areas will likely be bigger than the gun’s beaten zone or grazing fire coverage and adjustment is necessary. Traversing disperses fires in width by successive changes left or right but not in elevation. When engaging a wide target area, the gunner selects multiple aim points or makes subsequent traverse adjustments after successfully landing an initial burst and making T&E adjustments from there in even increments to ensure even, continuous coverage along the target area. Given that a cone of fire should be 2-4 mils in size, an adjustment of 4 mils from burst to burst creates overlapping coverage. Searching distributes fires in-depth by successive changes in elevation. Gunners employ searching fire against a deep target or a target having depth and minimal width, requiring changes in only the elevation of the gun. The amount of elevation change depends upon the range and slope of the ground. Traversing and Searching Fire combines elements of both traverse and search to distribute fires both in width and depth. These concepts are important for gunnery but aren’t really tested during routine qualification. The transition course is limited to fixed targets only and the 10-meter target has a bold outline for each paster so as to aim at each one individually. While not included as a standard qualification, targets can be used to emphasize these points. For example, a target series the has one aim point reference for five target areas that are invisible to the gunner. A one-mil black square is at the bottom, left, top, or right side of a given target area. After aiming in a firing an initial accurate burst, the gunner has to trust T&E adjustments to engage the remaining target areas. Machine guns really shine when they apply accurate, controlled fires over a target area. Firing over terrain with grazing or enfilading fires may not give a convenient aim point to hold on. Gunners need to understand how to apply fires to get the desired effect. Apr4 by John M. Buol Jr.
Once our zero range is more efficient (see Part 1), the shooter needs to test and validate their skills. A validation exercise is a timed and scored exercise. Only when passed does the Soldier finally attempt qualification. Ignoring the fact that Army doctrine does in fact require this (even if most personnel are oblivious to it), a common complaint against shooting additional exercises beyond zeroing is that it “wastes” time and ammunition. Consider the foolishness of this. A validation exercise can be conducted in a minute or so and takes only a few rounds. If this check is failed it indicates problems such that the Soldier will likely fail qualification so we can fix things first. It’s a “waste” to spend a 4-6 rounds to check that everything is a “go”, but somehow, it’s acceptable to spend 40 rounds in a full, formal qualification attempt to then find out problems. We never seem to have enough time and ammo to train and test skills but there’s somehow always enough to give a failing Soldier another 40 rounds to try another attempt to qualify. When used with on a more efficient 25-meter range discussed in Part 1, each shooter can conduct this quick test on their point regardless of what the rest of the line is doing, calling for an available range safety or instructor to time and confirm the attempt. Rather than assume a good zero and shooting skills, we conduct a simple, timed exercise. If there is a problem, we have the means to work on it. The old RETS (Remote Engagement Target System) qualification course with its three separate tables of fire will likely be used for the near future as the new Modified Barricade qualification is brought on. Here’s a validation test for it. When a shooter declares himself zeroed and ready, find four closely-batched E-type zero targets (scaled 300 meter or 250 meter targets) on the backer. Starting aimed in prone supported (or shooter’s choice), click a stop watch and allow 18 seconds to engage each target once. It’s a pass if the shooter gets three out of four hits. Look at DA 3595-R (Record Fire Scorecard) and the time limits there. Double targets run 6-12 seconds per exposure, leaving 4.5 seconds per target on average. 4.5 x 4 = 18 seconds. Also six seconds is a typical amount allowed for a 300 meter exposure. Given that the test starts aimed in and ready to shoot, the shooter only needs to transition to shoot three more targets. By using four close targets, it doesn’t matter which order they’re shot in as the shooter will have to transition up, down, left, and right to engage them all. This validation only takes four rounds and just over a quarter minute to run on zero targets on the 25-meter range. The new Barricade Modified uses the same targets and roughly the same exposure times as the previous qualification, however, the four phases are shot in one continuous table with only pre-planned and timed pauses in between. The shooting isn’t actually any harder but Soldiers that find this qualification more difficult is because they failed to prepare to move between phases efficiently. This validation tests for this. When a shooter declares himself zeroed and ready, find a fresh zero target, five rounds, three magazines, and complete issue web gear/FLC. Fill a magazine with two rounds each, another with one round, and stow them in magazine pouches. Go to condition Red, making ready with two more rounds in the third magazine. Have a peer coach give a “Go” command and start a timer/stopwatch. Starting from standing at low ready, go to prone and engage the target with two rounds, reload without command while moving into the kneeling position and engage with two more rounds from the second magazine, reload without command while moving into the standing position and engage with the last magazine of one round. The peer coach observes the target as this is being done. The prone shots should be in the 8 MoA ring (about the same width as a silhouette at 250 meters) or better. The kneeling shots should be in the 12 MoA ring (about the same width as a silhouette at 150 meters) and the standing shot should be in at least the 20 MoA (five inch) circle surrounding the black bullseye. All of this needs to be accomplished in 35 seconds or less. Here’s the time breakdown. Go-To-Prone should take about two seconds. Moving from prone-to-kneeling is allowed eight seconds and five for kneeling-to-standing for qualification. Eight seconds for two prone shots (same time as the 200-300 meter exposure), eight seconds for two kneeling shots (same time as the 150-250 exposure), and four seconds for one shot standing. Each shooter can conduct this quick test on their point regardless of what the rest of the line is doing, calling for an available range safety or instructor to time and confirm the attempt. Rather than assume a good zero and shooting skills, we conduct a simple, timed exercise based on the shooting and timing requirements of the qualification course. The shooter is conducting a Go-To-Prone (Drill H) and Fight-Up (Drill G) based on the Training Circular and in the same manner used during qualification. Time limits and accuracy standards are also very similar to the qualification. This validation only takes five rounds and a half minute to run on a single zero target on the 25-meter range. The 25-meter validation exercises test the shooter’s ability to hit targets and move through a course of fire requiring similar accuracy and time limits as the qualification. The only down side is they can’t test the ability to hit targets at full distance. It would be best to use KD range or a LOMAH (Location Of Mises And Hits) system but these likely won’t be available. Instead, we’ll validate on the RETS targets prior to shooting the qualification. With the old qualification, simply leave the 300, 200, and 100-meter targets up on bob mode. That is, put these targets up and set to drop when hit without any time limit. For a quick validation, have each shooter engage these targets with a maximum of five rounds. If all three targets aren’t hit at least once with five rounds, the validation is failed. If the shooter passed the 25-meter validation, a failure here is likely due to an improper zero that didn’t take a needed offset into account. As the name implies, the new Barricade Modified qualification demands that Soldiers engage using a barricade for support. It also requires moving through the four phases in one, continuous table of fire. Exposure times are about the same as the previous qualification, so the only real change is moving through positions efficiently and using a kneeling supported and standing supported position. This validation tests for this. The range is set by leaving the 300, 200, and 100-meter targets up on bob mode. Fill three magazines with two rounds each. Starting from standing at low ready, go to prone (supported or unsupported, your choice) and engage the 300-meter target with two rounds, reload without command while moving into the kneeling position and engage the 200-meter target with two rounds from the second magazine, reload without command while moving into the standing position and engage the 100 two rounds. Total time limit is 40 seconds, using the same time break down as given above. Each target must be hit at least once within this time limit to be considered a go. Also note, that a Soldier’s basic load includes seven magazines, the same number as three mags of two for the validation plus four more magazines of ten for the qualification. Given we lack full distance confirmation, these RETS validation tests provide a quick check that the Solider is zeroed and shooting well enough to likely pass a full test. It’s faster and cheaper than wasting 40 rounds on a full qualification attempt to find that out. A Postal Match is an organized marksmanship event in which participants shoot during routine unit qualification and are results submitted to an organizing body to tabulate and compare to others. Per Army Regulation 140-1, Chapter 7 (Marksmanship Training and Competitive Program), section 7-2 a. (11), the Chief, Army Reserve will conduct the World-wide Chief, Army Reserve Postal Matches. Army Reserve Marksman is the official US Army Reserve resource supporting marksmanship force wide. All Army Reserve units are encouraged to participate. The Army Reserve Postal Match is conducted every fiscal year. All Reserve units and Soldiers are eligible. To be counted in the current fiscal year event, scores are due by September 30. When submitting results be certain to include Public Affairs information so we can promote your unit and this event to USARC. Postal Matches are also a great validation exercise. The USAR Marksmanship Program has two. The first Postal Match is based on the current Excellence In Competition Match 321 used in Service Conditions matches. Based off courses of fire used at All Army and AFSAM (Armed Forces Skill at Arms Meeting), the entire match is shot at 25 meters on scaled targets and can be held during grouping and zeroing exercises during routine unit qualification. This is a good choice for Soldiers interested in attending these competitions. Place all targets 25 meters from the shooter. A PDF of these targets are available at ArmyReserveMarksman.info/postal-match. Any standard 8.5×11 size paper will work, however, heavier, matte paper about 67 pounds in an off white or light, dull yellow color is more like commercial target stock and superior to standard 20 or 24-pound copier or printer paper. After posting targets shooters will be granted a three-minute preparation period. Allow enough time between each stage of fire to refill magazines as needed. For Stage 1 – 400 is shot from the prone supported position at condition Red (charged magazine in place, chamber loaded, safety on “SAFE”) with nine rounds loaded. At the command to fire, assume a prone position and engage each target with three rounds each, reloading as necessary without command. The magazine may touch and/or rest on the ground. A sandbag or other support may not be used. A sling may be used, however it can NOT be looped on or around the arm before the command to fire is given. Time limit: 50 seconds. All shots fired after the “Cease Fire” command is given are penalized five points each. Maximum score possible: 45 points. At the command to fire assume a kneeling unsupported position and engage each target with three rounds each, reloading as necessary without command. External support may not be used. A sling may be used, however it can NOT be looped on or around the arm before the command to fire is given. Time limit: 50 seconds. All shots fired after the “Cease Fire” command is given are penalized five points each. Maximum score possible: 45 points. At the command to fire assume a kneeling unsupported position and engage each target with three rounds each, reloading as necessary without command. External support may not be used. A sling may be used, however it can NOT be looped on or around the arm before the command to fire is given. Time limit: 30 seconds. All shots fired after the “Cease Fire” command is given are penalized five points each. Maximum score possible: 30 points. The second postal match is based off the Modified Barricade qualification. The entire match is shot at 25 meters on scaled targets and can be held during grouping and zeroing exercises during routine unit qualification. Place all targets 25 meters from the shooter. See last pages of this document. After posting targets shooters will be granted a three-minute preparation period. Allow enough time between each stage of fire to refill magazines as needed. At the command to fire, assume a prone unsupported position and engage each 300-meter target with one round each, reload without command with the three-round magazine while moving into the barricade supported kneeling position and engage each 200-meter target with one round each, reload without command with the two-round magazine while moving into the barricade supported standing position and engage each 100-meter target with one round each. All shots fired after the “Cease Fire” command is given are penalized five points each. The time limit breakdown is 2+8+5 seconds to go-to-prone, then to kneeling, then to standing respectively. Five seconds are allowed for each 300-meter target and four seconds for each 200 and 100-meter target. This is a comparable, if faster, time standard to the qualification. The scoring rings award five points for hitting the Primary (switch) area, four points for hitting the Secondary (timer) area, and two points for the rest of the silhouette. This is the same suggested hit areas presented in the Training Circular and makes this course more challenging. The primary win with conducting validation is insuring Soldiers have practiced and proven their ability to shoot well enough to at least qualify. A validation test will catch those still struggling and allow for remedial training and help as needed. This will ultimately save time, ammunition, and make for a better trained force.